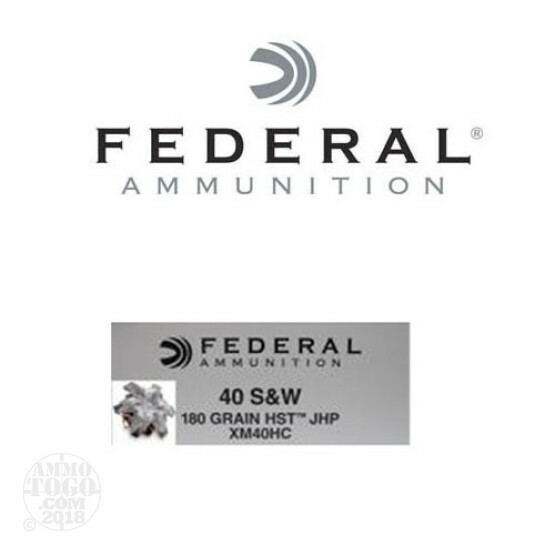 This is .40 S&W Federal 180gr. HST Jacketed Hollow Point Brass Cased Ammo. Federal HST is the next generation in high performance duty ammunition. HST offers consistent expansion and optimum penetration for terminal performance. A specially designed hollow-point tip won't plug when passing through a variety of barriers and this bullet holds its jacket in the toughest conditions. HST is engineered to provide 100% weight retention through most barriers and impressive expansion. This ammo is packed 50rds. per box. This is the same exact ammo as Federal Tactical HST just in white overrun box. This ammo is brass cased, boxer primed, non-magnetic and non-corrosive. It comes packed in 50rd. boxes.